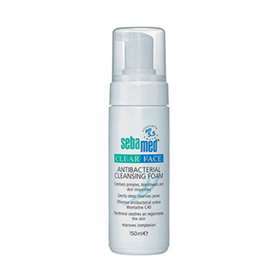 Clear Face antibacterial cleansing foam have been developed by Sebamed especially to combat skin impurities such as blackheads and pimples. Sebamed clear face cleansing foam gently cleanses deep into the pores to remove excessive sebum and dirt particles the cause of skin impurities. Use Clear Face cleansing foam in the mornings and evenings. Dispense a small amount into the palm of your hand and gently massage into the skin. Leave foam on wet skin for up to 5 minutes. This helps to combat bacteria, rinse off thoroughly. Aqua, Cocamidopropyl Betinamide MEA Chloride, Cocotrimonium Methosulfate, Sodium Lactate, Panthenol, Parfum, Phenoxyethanol.